the COptionParser class is the main command line parsing class. You can control the name of it using the cxx_class variable. Definition at line 166 of file COptionParser.h. Definition at line 224 of file COptionParser.h. Definition at line 196 of file COptionParser.h. Definition at line 221 of file COptionParser.h. Definition at line 74 of file COptionParser.cpp. Definition at line 185 of file COptionParser.cpp. Definition at line 190 of file COptionParser.h. Definition at line 182 of file COptionParser.h. Definition at line 186 of file COptionParser.h. Definition at line 80 of file COptionParser.cpp. Referenced by COptions::init(), and main(). Definition at line 100 of file COptionParser.cpp. Definition at line 229 of file COptionParser.cpp. Definition at line 390 of file COptionParser.cpp. Definition at line 307 of file COptionParser.cpp. Definition at line 641 of file COptionParser.cpp. References copasi::SBMLSchema_L1V1, copasi::SBMLSchema_L1V2, copasi::SBMLSchema_L2V1, copasi::SBMLSchema_L2V2, copasi::SBMLSchema_L2V3, copasi::SBMLSchema_L2V4, and copasi::SBMLSchema_L3V1. Definition at line 194 of file COptionParser.h. 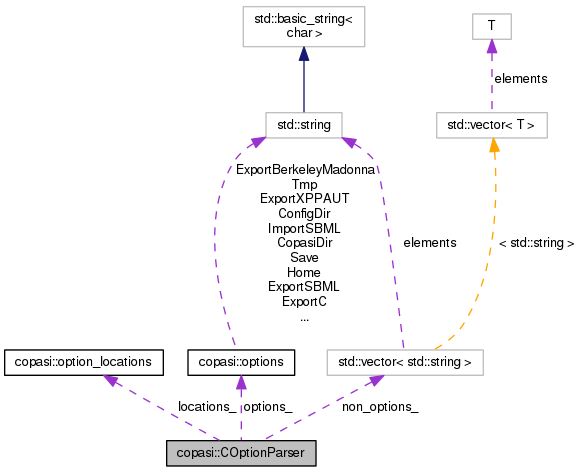 Referenced by COptionParser(), and get_locations(). Definition at line 222 of file COptionParser.h. Definition at line 193 of file COptionParser.h.